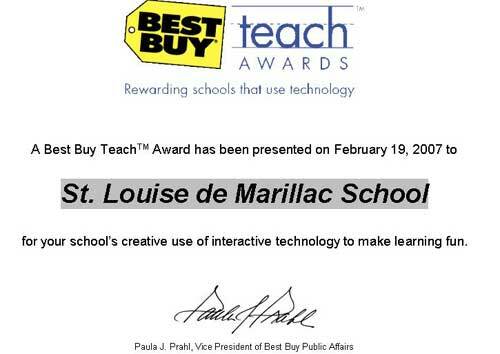 A $2,500 Best Buy Teach Award has been presented to St. Louise de Marillac School for demonstrating how interactive technology can be used to make learning more fun for students. John Hoffman, Best Buy Gen. Manager and teacher Zee Ann Poerio with an ancient coin of Augustus in front of the newest technology in the store. 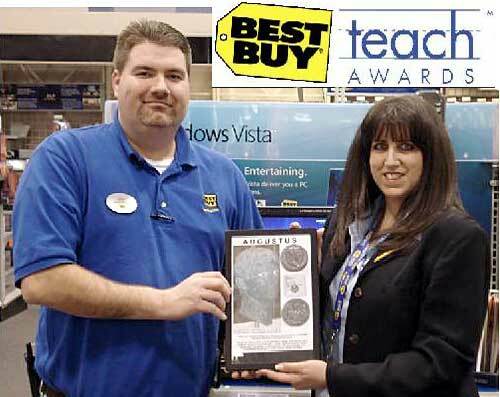 Best Buy selected the project submitted by teacher, Zee Ann Poerio, based on the unique approach of integrating interactive technology with the study of ancient coins and Classics through the Ancient Coin Museum project. The museum which features students from the St. Louise de Marillac School Latin Club as docents was developed by Mrs. Poerio with Ancient Coins for Education (ACE) and has been featured at Classics conferences and educational events across the country. Poerio teaches third grade at the Pittsburgh based school and is the advisor for the Latin Club. She serves as a director for Ancient Coins for Education, Chair of the Excellence Through Classics Board for the American Classical League (ACL), on the Education and Youth Programs Task Force of the Ancient Coin Collector's Guild and was recently invited to join the Primary Latin Project Committee of the UK as one of two representatives from the United States. Best Buy, the nation’s largest electronic retailer, believes technology can excite and engage students creating a more valuable educational experience. 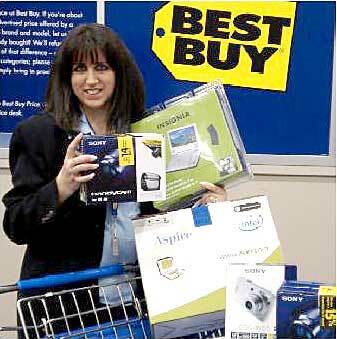 The Best Buy Teach Awards are to be used to purchase technology at Best Buy to extend, expand, or enhance the proposed project. By offering this grant to schools, Best Buy encourages and supports the creative use of interactive technology to make learning fun. Poerio quotes Cicero, "Quod donum majus reipublicae offerre possumus,quam adulescentes docere et instruere?" which translates as, "What greater and better gift can we offer the republic than to teach and to instruct our youth." "I feel that I have found the ‘perfect gift’ for students by introducing Latin in the classroom and sharing these tiny ancient coins, which are tangible links to the past." Despite the benefits of the study of Latin, in many districts it is not part of the required school curriculum, no funding is available for programs, and there is a critical shortage of primary and secondary school Latin teachers. Teacher Zee Ann Poerio with technology she will put too good use. The Ancient Coin Museum was developed as part of a program to promote Classics and is used as a teaching tool to discuss the origins of money while incorporating languages through the inscriptions of ancient coins, as well as ancient history, art, myth, and its influence on modern coins. The hands-on ancient coin museum features students who serve as docents and teaches them about Classical studies, while stimulating creativity and developing problem solving skills. By researching coins on the internet, communicating by e-mail with numismatists as mentors through Ancient Coins for Education (ancientcoinsforeducation.org), and sharing digital images of their coins, the students have learned about the language, history, and culture of ancient civilizations. This project has welcomed the interest of current and former students, parents, teachers, the local community,and evolved into a multi-disciplinary teaching tool which started a collaboration with national numismatic and Classics organizations to create a positive learning experience that brings Latin and ancient history to life. The Ancient Coin Museum Project enables 1600 year old, tiny pieces of metal from the ancient world to teach volumes. Inspired by support received from ACE, the ACCG, and the ACL, and the ANA, Poerio states that "it has been my hope to continue to 'share the wealth' of information that the study of ancient coins and Classics has to offer" and the "Buy Teach Award will enable me to continue to do this through interactive technology in the classroom."